VDX Internet Services Review 2019: Is VDX Internet Services a Good Hosting? VDX Internet Services has been providing website hosting with SSD storage since 1999. It is a long-standing company, with a range of pricing from affordable to overpriced. VDX Internet Services (VDX) has been providing website hosting services in the Netherlands since 1999. Claiming to be “one of the largest web hosting players in the Benelux” (although I can’t back that up), it has more than 15,000 customers and 100,000 domains registered. The website is available in Dutch only. VDX sells a range of website hosting plans that are compatible with WordPress, Drupal, and Joomla!. The plans all use SSD storage for faster disk read/write speeds, along with the user-friendly Plesk control panel. The Linux plans come with CentOS, while if you require ASP.net, ASP, or a Microsoft SQL database, there are also Windows plans available. All of the plans support PHP versions 5.6 through 7.2, as well as FTP access. If you’re a developer, you might like the integration with Git via the Plesk control panel, and beginners will likely appreciate the WordPress Toolkit 2.0, making it possible to create a staging environment of your WordPress installation. The affordably priced base plan comes with unlimited traffic and 10GB disk space, which is more than enough for most people. However, if you need more than 10GB disk space, you’ll need to upgrade to one of the higher tier plans, which do get quite pricey. Also, all of the plans only include one domain, in case that’s an issue for you. The plans can be purchased in monthly terms only, so there are no long term discounts available. Domain names, SSL certificates, and, oddly, “Premium AntiSpam” are always optional added costs to consider. If you need to contact customer service, the team is available Monday to Friday from 9:00 a.m. to 7:00 p.m. by phone, Monday to Friday from 9:00 a.m. to 9:00 p.m. by email, and between 11:00 a.m. and 1:00 p.m. only on Saturday and Sunday. There’s a small FAQ section on the website, as well as support via TeamViewer. My experience with the support team was positive. 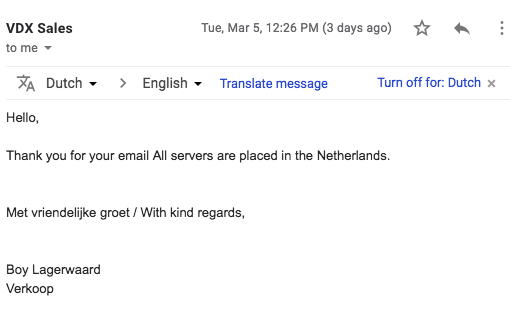 I contacted the team mid-morning on a weekday via email to confirm the location of the servers and received a reply on the same day letting me know all the servers are located in the Netherlands. VDX has close to 300 positive reviews on Trustpilot, with only 1% of them being negative. If you need less than 10GB of disk space, you can get a good price, however, the upper tier plans get overly expensive, without increased value-adds. Wondering how VDX Internet Services stacks up against other Web Hosting companies? Enter any other Web Hosting company and we will give you a side-by-side comparison.